Aerials of Mission Valley. 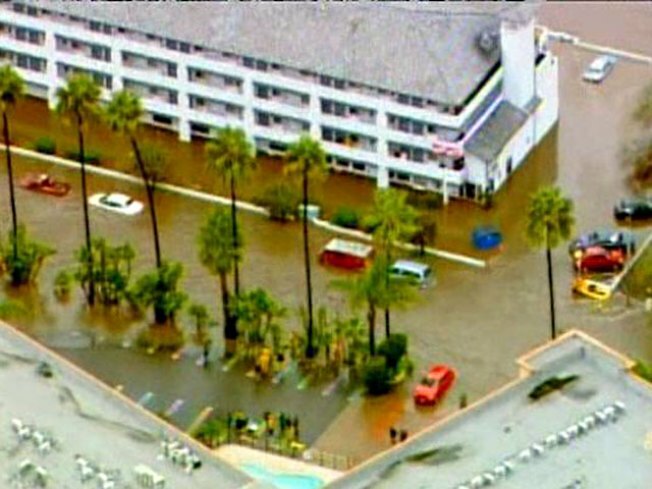 This is the hotel where at least 40 people were trapped by the rising water. Acting Gov. Abel Maldonado has sent a letter to President Barack Obama asking for a major disaster declaration for California, citing damage in San Diego and 10 other counties. Maldonado said the damage wrought by 10 days of bruising storms was too much for state and local governments to handle. A disaster declaration by the president would free up federal funds and resources to help respond to damage caused by the storms. On Wednesday, San Diego County escaped the widespread problems seen last week from heavy rains and flooding, but the storm wasn’t without problems. Flooding at Qualcomm was expected to have an impact on parking at the Holiday Bowl on Thursday. 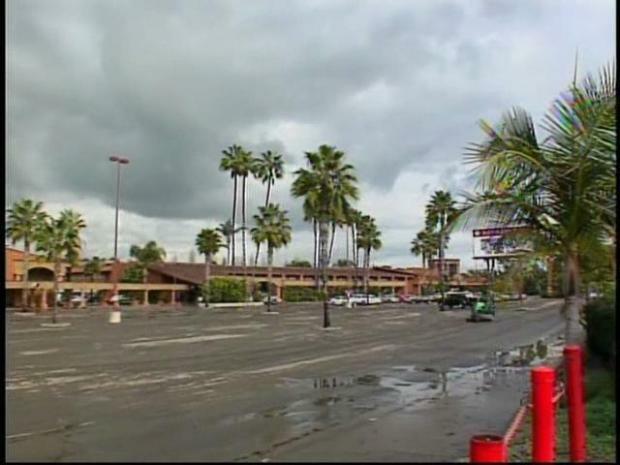 About 3,000 of the stadium's 14,000 parking spaces were expected to be unusable after being covered with water or mud. Still, Qualcomm officials were optimistic. It's the worst flooding San Diego has seen in 20 years. 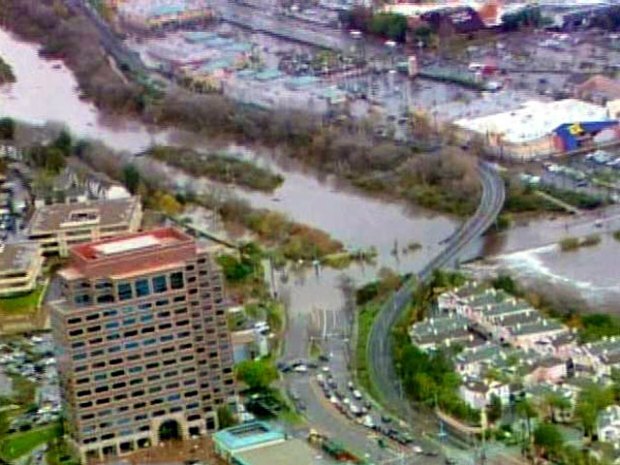 Major cleanup was underway in Mission Valley on Thursday after the San Diego River flooded and caused widespread problems. Qualcomm wasn’t the only weathered part of the county. In Oceanside, a sinkhole formed on Southbound El Camino Real. Under the surface it was 10 feet across and 10 to 15 feet deep. 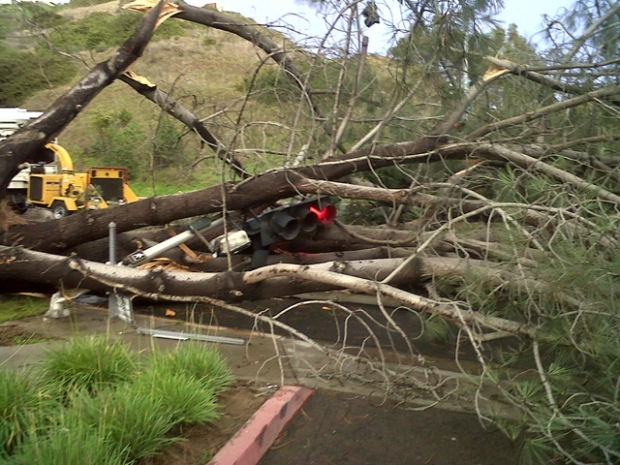 A tree also came crashing down, blocking a street in La Jolla. “It's just scary. I mean now you see it, it's already fallen, but imagine if it had fallen on somebody's car and somebody had died out of this,” said resident Nadia Sliheet. A huge sinkhole on Riverwalk Drive, near Fashion Valley, was a nuisance for shoppers. Repairs won't be made until next week.